When teaching about Ellis Island, Immigration, and Urban Life in the late nineteenth century, explain to students that this time period is often referred to as The Gilded Age. It was a time of immense change, altering the United States from a mostly rural nation to a highly industrialized one. Teachers should note to their class that not all was perfect in this new society. There were tremendous amounts of corruption in the government and an immense gap between the wealthy business owners and the poor labor force, especially in the cities. Poor families crowded into tiny, filthy tenements, working long hours under dangerous factory conditions. Immigrants especially, who flooded into the United States through Ellis Island, had it tough. Nonetheless, they were happy and excited to be in America. No matter how tough their lives were in America, nothing could compare to what they left behind. America, especially New York, symbolized opportunity. Many immigrants came to the United States looking for better opportunities and an escape from starvation and persecution. In America, a man could work to support his family and above all else, he was free. Free to earn a living, free to worship as he wished, and free to raise his family without fear of the government. The Gilded Age gets its name because underneath the thin layer of gold, beauty, and prosperity was corruption, filth, and poverty. As you teach Unit 11, your students will understand the changes that our nation underwent at this time. The unit encompasses immigration through the golden doors of Ellis Island and urban life in the Gilded Age. It explores the technological innovations which led to the rising mechanization of the production process and led to the need for massive amounts of unskilled workers. On a positive note, industrial mass production created new jobs, but on the other hand, it also changed the quality of work. Gone were the traditional crafts and trades. Instead, workers performed repetitive and monotonous duties day in and day out . . . for little money, for long hours, and usually under extremely dangerous conditions. To improve their plight, many workers formed and joined labor unions. Employers and business owners, however, made it very difficult for labor unions to flourish and succeed. The Gilded Age gave birth to the working class and also contributed to the rise of corporate empires and capitalism. Sadly, many skilled and talented craftsmen and entrepreneurs simply could not compete with the large empires. As a result, most of the nation’s wealth remained in the hands of a select few. When you teach this unit, be sure to incorporate the multimedia project. Students customize a powerpoint presenation based on personal narratives from immigrants who passed through Ellis Island. A good book with many oral testimonies for this project is Island of Hope, Island of Tears: The Story of Those Who Entered the New World through Ellis Island-In Their Own Words by David M. Brownstone, Irene M. Franck, and Douglass Brownstone. This unit contains two additional PowerPoint presentations to teach with. 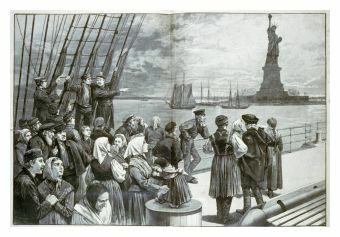 The second set deals with the Immigrant's experience on the ships coming to America and their arrival at Ellis Island. I believe the topic deserves its own PowerPoint presentation. A list of key terms for this unit to get your students acquainted with Ellis Island, Immigration, & Urban Life in America. A PowerPoint presentation on this unit. A complete set of Fill-in-the-Notes for your students. Simply print the slides (six per page) and give each student a copy as you present the unit. This project involves primary sources, the use of technology such as PowerPoint, and oral presentation skills. In addition, students must use creativity in this project. A grading rubric that informs students how they will be graded on the project and makes it easier for you when you do grade it. A study guide to prepare students for the test; I always make mine a mandatory assignment. 42 slides filled with primary sources on the immigrant experience before and after Ellis Island. A complete set of Fill-in-the-Notes for the second PowerPoint presentation. © Copyright OwlTeacher.com All Rights reserved. Sign up for OwlTeacher's Newsletter below and get more inspiration, ideas, and worksheets via email. I promise to use it only to send you OwlTeacher's Newsletter.